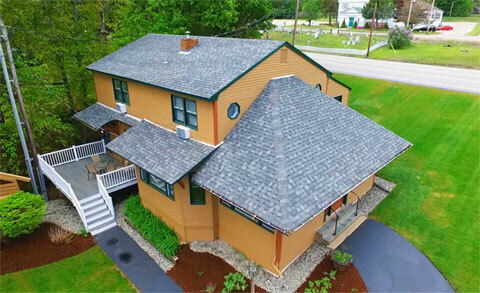 Our well-appointed Inn offers luxurious, modern accommodations along a sandy beach in the quintessential lake town of Center Harbor. Experience rustic wood tones coupled with modern design and creature comforts. Guest privileges include access to slip or mooring rentals at the onsite dock system. Overlooking 200 feet of pristine sandy beach on the shores of Lake Winnipesaukee, the Lakeside Vista Rooms are perched within feet of the water. Offering wrap-around decks with unfettered access to some of the most breath-taking views available on the lake, these highly desirable hotel rooms balance an inviting mix of rustic tones with modern finishes. 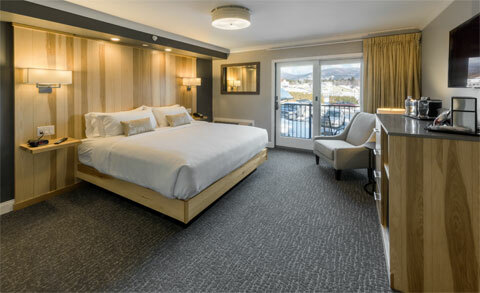 Relax in your king size bed and take in the vistas. Room amenities include a large flat-screen TV, a mini-fridge, a microwave, a coffee maker and a modern fully tiled bathroom with glass paneled showers and custom hickory vanities. Enjoy the lakeside setting on your private balcony. 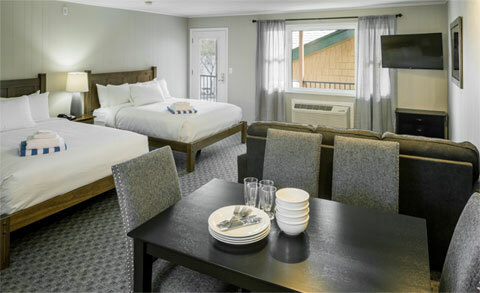 The Lodge King Rooms offer the perfect blend of modern design and rustic tones for your next Winnipesaukee getaway. Relax in your welcoming king size bed with its signature floor to ceiling hickory headboard or spend an evening enjoying the views and fresh lake air from your deck. Room amenities include a large format, flat-screen TV, a mini-fridge, a microwave, a coffee maker and a modern fully tiled bathroom with glass paneled showers and custom hickory vanities. With sleeping for up to 4 guests, experience an authentic lake side getaway with your friends or family. 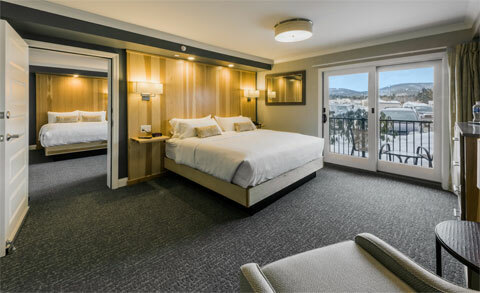 The Lodge Double Queen Rooms offer the perfect blend of modern design and rustic tones for your next Winnipesaukee getaway. Enjoy the extra sleeping capacity of two queen beds set against a beautiful floor to ceiling, accent headboard. Room amenities include a relaxing balcony, large format, flat-screen TV, a mini-fridge, a microwave, a coffee maker and a modern fully tiled bathroom incorporating a custom hickory vanity and a bathtub. Ask about renting the adjoining Lodge King Room for extra sleeping capacity. 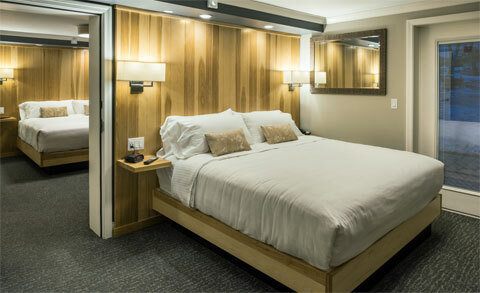 Enjoy extra sleeping capacity for your friends or family in this combination unit that ties together our Lodge King and Lodge Double Queen hotel rooms through a convenient communicating door. Enjoy the lakeside setting from your private balconies and fold back the privacy screen to take full advantage of the outdoor space. Accented with modern design and rustic elements, this combination unit offers one room with a king size bed and an adjoining room with two queens. Each room includes a large format, flat-screen TV, a mini-fridge, a microwave, a coffee maker and a modern fully tiled bathroom incorporating a contemporary shower in the king portion and a bathtub in the queen portion. Get close to the action with these unique rooms just steps from our sandy stretch of beach. Experience direct access to our 4-season, outdoor hot tub and lakeside beach facilities. 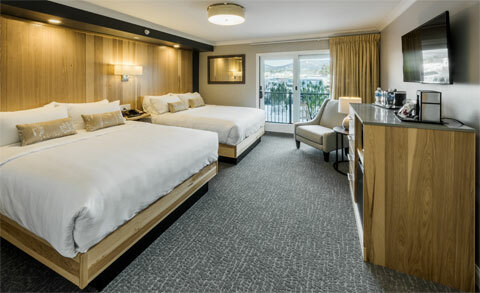 The Beach Level King Rooms offer the perfect blend of modern design, rustic features and unparalleled access to Lake Winnipesaukee. Relax in your king size bed or spend the day lounging on the beach with the comfort of your room just a few feet away. Room amenities include a large format, flat-screen TV, a mini-fridge, a microwave, a coffee maker and a modern fully tiled bathroom incorporating either a contemporary shower or bathtub. Get close to the action with these adjoining rooms just steps from our sandy stretch of beach. Experience direct access to our 4-season, outdoor hot tub and lakeside beach facilities. The Beach Level Combined King setup offers the perfect blend of high-end design, unparalleled access to Lake Winnipesaukee and extra space for friends or family. 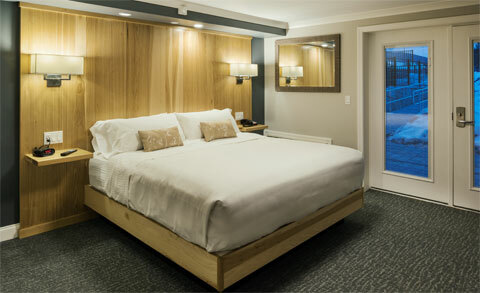 This configuration of communicating hotel rooms offers two king size beds framed against floor to ceiling rustic hickory headboards. Other room amenities include large format, flat-screen TVs, mini-fridges, microwaves, coffee makers and a modern fully tiled bathrooms incorporating either a contemporary shower or bathtub. Enjoy some extra legroom in these larger efficiency rooms located above the main check-in office. 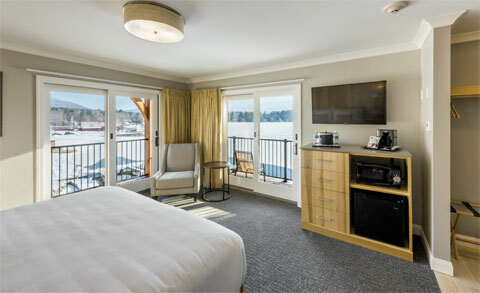 With sleeping for up to 6 guests these rooms offer a great option for your next lakeside retreat with friends or family. Experience a larger room layout with two queen size beds, a full size pullout sofa and a comfortable sitting area. Room amenities include a large format, flat-screen TV, a mini-fridge, a microwave, and a coffee maker. Our Efficiency Rooms offer a solid value with the same great access to our unique resort amenities. Enjoy all of the amenities and lake access at the Inn with these cozy hotel rooms on the second floor of the detached vacation cottage. The Cottage Queen Rooms offer renovated hotel accommodations that include updated bathrooms. These units strike the perfect blend of comfort and affordability for your next Winnipesaukee Vacation. 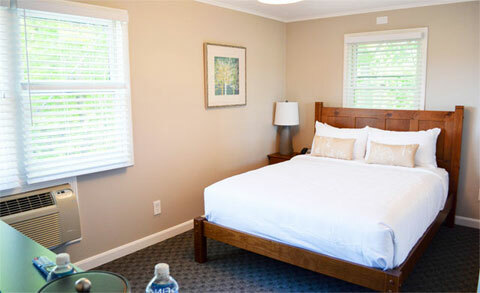 Relax in the cozy queen size bed after a long day exploring the Lakes Region and kick back to enjoy some television. Room amenities include a flat-screen TV and a coffee maker. Enjoy plenty of creature comforts in this spacious suite, located on the first level of the detached vacation cottage. The Cottage King Suite offers one of the largest rooms available on the property with recently updated living space and a fully renovated bedroom and bathroom. This unit is one of the best values available at the Inn. Suite amenities include a King size bed in the master bedroom and a queen pullout sofa in the living space. Enjoy ample legroom with a large living room, an attached dining room and a full kitchen. Room amenities include a stove, microwave, full size refrigerator, coffee maker, large flat-screen TV and dining area. The perfect option for your next family getaway, our five bedroom standalone vacation cottage offers a rustic Lake Winnipesaukee retreat with sleeping capacity for up to 10 guests. 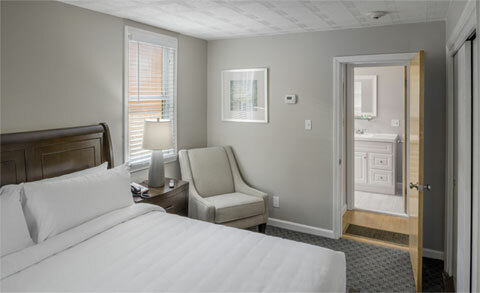 The cottage includes four freshly renovated guest bedrooms with queen size beds and private bathrooms on the second floor and a remodeled master bedroom with a king size bed and separate bathroom on the main level. Other features include a full kitchen, a large living room, a separate dining area, a private porch off of the main level and a washer and dryer off the kitchen.